A Shenandoah Sampler: It's been too long! It is cloudy, cold and drizzling here in the Shenandoah. 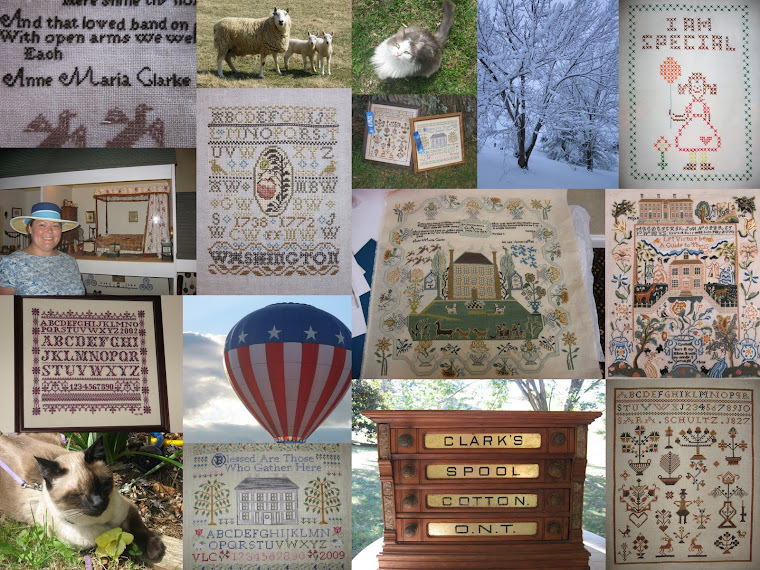 However, I am tickled pink to finally be back here on the blogs with my fellow needleworkers. It has been a crazy couple of weeks and I greatly appreciate your kind words and positive thoughts. I have missed being here more than you know. I promise to get caught up on my emails and comments soon! While I am still working two jobs, I am really trying to carve out more "ME" time. I came to the conclusion that I am not 21 anymore and cannot run on a few hours of sleep a night anymore. I took my Social Studies Praxis, so that is out of the way and I only have five weeks left of class for my teaching licensure. The end is in sight and I could not be happier! I am posting this before I go to bed but I will be back in the morning ready to catch up on all of the wonderful progress that everyone has certainly been making. Eventhough I am still new to the blogging world, I can honestly say that not commenting or blogging was like being away from a really good friend for too long. I am glad to be lurking and blogging again! I did get some stitching done over the past few weeks and I thought that I would share with you. Again, I used my scanner and if you click on the picture you can get a close up of the stitches. 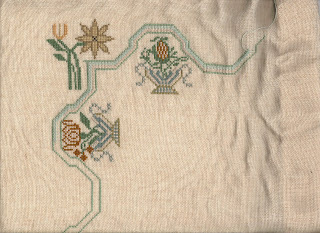 I was able to get the flower pots and the flowers stitched as well as a bit more of the border. The flower pots are queen stitches but the handles are rice stitch with two different colors of silk. I am not sold on how they look but the directions said to cross over the four crosses in ecru with one large cross in the blue. This week I will have a bit more free time and hope to have another picture soon! Like I told my husband, money is nice but now more than ever I need to keep my sanity and my needlework is my therapy! A girl has gotta have her priorities! With all the craziness lately, I did get to my LNS a couple of weeks ago. Many of the things that she bought at market were still coming in so I did not get to see all of the new pretties. However, I did purchase a wonderful new needlework organizer. At first I was not sold on it but Teri, the owner swore that I would love it. Boy, was she right! It folds up so I can take my needlework with me and there is even a handy dandy strap so I can throw it on my shoulder and go! There are eight different outside pockets for various tools and threads and the inside is large enough for several projects and patterns. What I love about my new organizer is that I can get everything out and put everything away by just folding the organzier. It is so nice not to leave things out to get lost, stepped on or...well if you have animals, you know what other accidents can happen! It is called the "Handy Caddy" and they have a website http://www.handycaddy.com/. Oh, and another plus is that it is clear...so I can see what I have or haven't got! I also purchased a new hoop. Now, it has been years since I used a hoop and as some of you may remember, I have been obsessed with stitching in hand lately. I was discussing my queen stitches with Terri, the owner of my LNS, and she recommended that I use a new type of hoop. She said that I would fly through queen stitches with it. Well, honestly I was not sold on using a hoop but she was so adamant and I've had several of the good folks here on blogger also suggest that I try hoops again....so I agreed to try it. Thank you to all of you who persuaded me...I can now say that I love my new hoop! It called the Morgan No-Slip Hoop. It has a patented tongue and groove that keeps the fabric from slipping so it stays taut all of the time and I do not get a sore wrist like when I was constantly tightening my q-snap. Because the fabric is nice and taut, I can fly through those queen stitches! The only way that I got as much done on Richmond Sampler over the past few weeks has been because of my new hoop and organizer. So glad to see you back, Valerie! I've missed you! Your Richmond sampler looks great - a very impressive project! That's the same type hoop I use for needle punch 'cause it holds everything so taut. Good luck with the rest of school - I'm so happy for yoU! I was thrilled to see your post this AM! I have missed you! Thanks for the pictures of your new hoop and organizer! They look neat! Yes, you need to carve out some 'me' time for yourself! Oh Valerie! I was so glad to see your blog at the top of my blog list this morning!! I have been wondering where you were. I had even tried sending an email but the crazy computer was running slow and I neer got confirmation that it was sent so I wasn't sure whether or not you got it. I'm glad that things are winding down for you class wise, that is. Your sampler looks lovely. I am glad that the new hoop has been helping the queen stitches pass by faster.Love the organizer! Glad to see an update from you! Toodles. Valerie - it's tough juggling work, school, and home life. So glad to see your progress on your sampler - I just love this piece! Btw, your package should arrive this week. I love your sampler so much! Glad you found a new organizer and hoop to make your life easier! Good for you! Nice to see you back, the Richmond Sampler is so pretty!!! Glad you like your hoop. I go back and forth between in hand and on a frame, when I don't want to stitch in hand I like Q-Snaps :-). The sampler is gorgeous and I love seeing your progress snaps. Love the handy dandy new organizer too. Glad the hoop is helping you with the queen stitch. I'm an in-hand stitcher myself... but I say whatever works for you is the best. I love your queenies! Very pretty! That sampler is so pretty! I'm happy to hear that things should calm down for you soon. It was good to see you posting again, Valerie! Good for you for finding what works for you queen stitches. Love your progress! Valerie... I love your sampler !!! Hey, I also understand about setting priorities straight :-) Stitching is a necessity like water or food ! I wanted to ask you a question about the hoop. I have always heard that hoops mark the fabric, is that so or is this a better hoop? Let me know. Your sampler is looking great! I finally got some new scroll bars and so I am going to pick up Richmond again this weekend, if not before. I was inspired by reading your blog so finally started one of my own and my progress pics are posted - some flowers but no queens yet. Catching up on those queens will be the first thing I do when I pick it up again. Your new hoop looks great - I may need to look into one of those for my Mom, who really needs a new hoop!